This is the third offering from Stephanie in the Anna and the French Kiss trilogy. It takes us back to the school in Paris where we get to catch up with Josh- the friend of St Clair, Meredith, Anna and Rashni- who has been left behind to complete school without them. We are also introduced to Isla who briefly appeared in Anna's story where we learnt of her crush on Josh. The story follows her and Josh's relationship and how they will cope with Josh's flippant attitude towards education and how they will remain together following school with the prospect of living on opposite sides of the Atlantic. I liked Isla, she lacked the witty humour of Anna and the outlandish personality and confidence of Lola, but to me she was much easier to relate to because of it. I felt as though she was the sort of girl who goes unnoticed, and I liked her for that. To me she was the most 'normal' of the three girls, she was the sort of girl I would have been if I were to appear in a Stephanie Perkins novel. I enjoyed getting to know Josh a bit more and I was pleasantly surprised. Although he had appeared in Anna and the French Kiss, the majority of the time was spent with his tongue down Rashni's throat. He is the brooding arty type and I could see exactly why Isla harboured such a big crush on him. It was nice to see Isla come out of her shell as the book progressed and due to the first person narrative I felt as though I was inside her head and she was a brilliant example of the fact that quiet people can have loud thoughts. The narrative allowed the reader to know things that she would never have said aloud and consequently created a much more rounded character. My favourite part was of course the bringing together of all the characters. I can't deny that I internally squealed when Cricket and Lola reappeared (they are my favourite couple), and whilst I do find Anna and St Clair's relationship a bit sickly, I was also glad to see them. 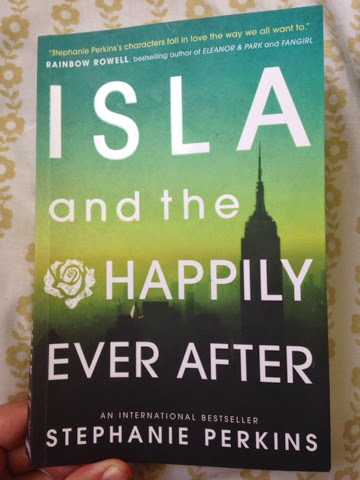 Isla and the Happily Ever After was a brilliant ending to a brilliant trilogy, I gulped it down in one sitting and now I am just sad that I haven't got another one to go to!